John Halani finds it difficult to talk about the powerful emotions that stir in him when he is asked about Uganda. But the passion in his eyes speaks volumes to the connections he has to his African homeland. Like many in British Columbia’s Ugandan community, Halani and his family were among tens of thou-sands people who were uprooted by Idi Amin’s military regime and forcibly expelled from the place they called home in 1972. “We can always think of what may have been if we were not thrown out of Uganda . . . but we prefer to find ways to help Uganda,” said Halani, a Vancouver hotelier, whose spirit of giving ranks him as one of the most prolific philanthropists in B.C. Today, some 40 years after the forced exodus, Halani and the Uganda Cultural Association of B.C. will host the first Uganda-Canada Business and Social Convention at the Sheraton Wall Centre Hotel in Vancouver. Expected to attract over 300 delegates, the three-day convention is aimed to build trade, cultural and investment bridges between Uganda and Canada; one of many events that will lead up to Uganda’s 50th Independence Day celebrations later this fall. “Despite all that has happened, there is a strong desire by Ugandan-Canadians to give back and participate in Uganda’s development,” said Halani, who frequently travels back to his place of birth with local volunteer doctors to conduct medical camps. Halani, who also serves as the Honorary Consul for Uganda in Vancouver, said one of the main objectives of the convention is to leverage the passion shown by Ugandan-Canadians to help shape their homeland. This passion for community development also runs deeply in Carol Magambo, who is a manager at the Simon Fraser University and president of the Uganda Cultural Association of B.C., that serves about 8,000 Ugandan-Canadians in the province. “Like Canada, Ugandans come from various backgrounds and walks of life and, over the years, politically-engineered issues have caused deep social wounds in our homeland,” said Magambo. “Canada and this convention will help us heal those wounds and provide ways to show our passion and love for Uganda. “I hope the convention will con-tribute towards the greater good of improving and bettering both Canada and Uganda and our communities.” Sam Hirji, a Vancouver-based businessman, whose family was also ousted by Idi Amin, hailed the convention as a landmark event for the local Ugandan community. “This convention has great potential for the Ugandan community to harness the opportunities that Canada offers and celebrate our multi-cultural values,” said Hirji.Among those attending the conference will be senior ministers from Uganda and officials from the Uganda Investment Authority and Department of Foreign Affairs Trade and Investments Canada. The keynote speaker is CNN hero Derreck Kayongo, whose Global Soap Project collects partly-used hotel soap and reprocesses it to pre-vent diseases and save lives. Since 2009, Kayango’s Atlanta-based non-profit has provided about 150,000 bars of soap for 10 countries. For Justus Mirembe, the convention’s public relations officer, Kayon-go is an inspiration for Ugandans. “His work could be a multi-mil-lion-dollar business but all he wants is to give back to Uganda and Africa . . . that is amazing for someone who left as a refugee,” said Mirembe.”Many Ugandan-Canadians here in B.C. have volunteered their time, talents and money to help others in the community and organize this convention . 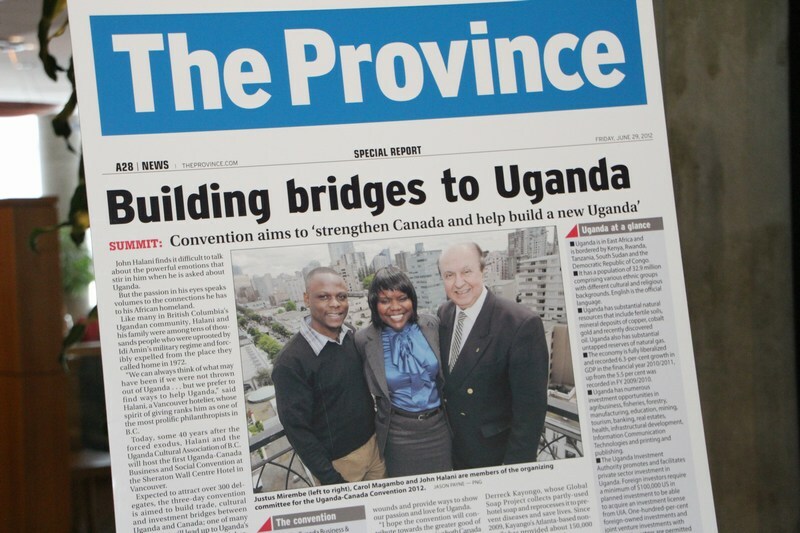 . . that is our passion, which we hope will strengthen Canada and help build a new Uganda,” said Mirembe. 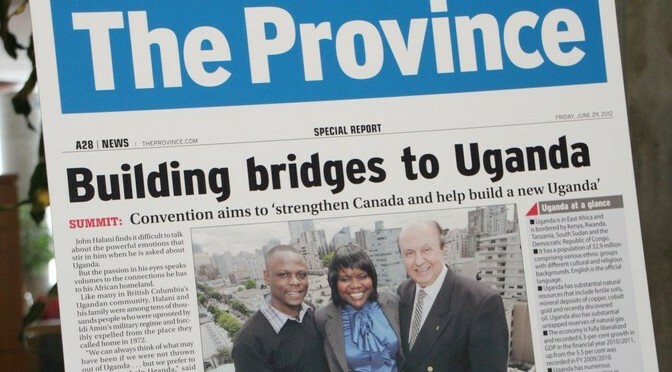 The Uganda-Canada Business & Social Convention will be taking place from June 29 to July 2, 2012 at the Sheraton Wall Centre Hotel in Vancouver. In addition to business forums, there is a whole slate of entertainment and social events planned, including a boat cruise. For more information/last minute registrations go to www.ucabc.ca. Uganda is in East Africa and is bordered by Kenya, Rwanda, Tanzania, South Sudan and the Democratic Republic of Congo. It has a population of 32.9 million comprising various ethnic groups with different cultural and religious backgrounds. English is the official language. Uganda has substantial natural resources that include fertile soils, mineral deposits of copper, cobalt gold and recently discovered oil. Uganda also has substantial untapped reserves of natural gas. The economy is fully liberalized and recorded 6.3-per-cent growth in GDP in the financial year 2010/2011, up from the 5.5 per cent was recorded in FY 2009/2010. Uganda has numerous investment opportunities in agribusiness, fisheries, forestry, manufacturing, education, mining, tourism, banking, real estates, health, infrastructural development, Information Communication Technologies and printing and publishing. The Uganda Investment Authority promotes and facilitates private sector investment in Uganda. Foreign investors require a minimum of $100,000 US in planned investment to be able to acquire an investment license from UIA. One-hundred-per-cent foreign-owned investments and joint venture investments with domestic investors are permitted in Uganda. The Canadian International Development Agency has disbursed approximately $350 million in humanitarian assistance to Uganda Trade between Canada and Uganda is modest, totalling just under $15 million in 2010. Canadian exports (primarily used clothing) were worth just over $11 million, while imported Ugandan goods (primarily vanilla beans, coffee, tea and cobalt) totalled $3.7 million. Mr John Halani absconded money from the Agakhan Masaka Jamatkhana. In 1971, General Idi-Amin Dada raided the Ismaili Jamatkhana in Uganada, Mr Halani, the Honorary President of the Ismaili Masaka Council decided to remove money from the Jamatkhana. In 1972 in Canada ,he purchased 2 apartment building (1630 Burnaby St & 1278 Nicole St. In﻿ 1974 acquired the Robsonstrasse, the Tropicana Hotel. According to supreme court discovery, he states when he arrived in Canada in 1972 with only $30,000 USD.